From what older students tell me, it’s been like this for years. And what’s causing it? The fact that you can only purchase the application paper at that one spot. It’s relatively cheap (less than half a euro per application), but you still have to pay for it, because the faculty wants as much money as possible. This process of giving money and the clerk printing the fiscal receipt and giving you the application takes some 15-20 seconds or so per person, but because of the number of people who need the application, it means you end up waiting over an hour in order to buy a piece of paper. The problem doesn’t really affect the professors and the working of the faculty, if we take out the fact that every 3 months people will be frustrated by having to stand in long queues. Oh, it also degrades our image as an institution, but that’s nothing new to us. In any case, none of the professors is interested in solving this situation, since it doesn’t really affect them in any way (apart from having to walk through the crowd when they enter the faculty building, because that’s where the place for buying the applications is). But, here’s something which makes the whole situation even more bizzare. You can buy that piece of paper all year long! That’s right, during most of the year when there are no queues whatsoever, you can go and buy that very same piece of paper! This means that for every person that buys the application form before the exam period means that there will be one less person in the queue during the exam period; or maybe there won’t be, gasp, any queue at all! Everyone knows that you can buy these forms throughout the year. So why don’t they? So, let me try to sum up: every 3 months, every year, without fail, you have the same problem. 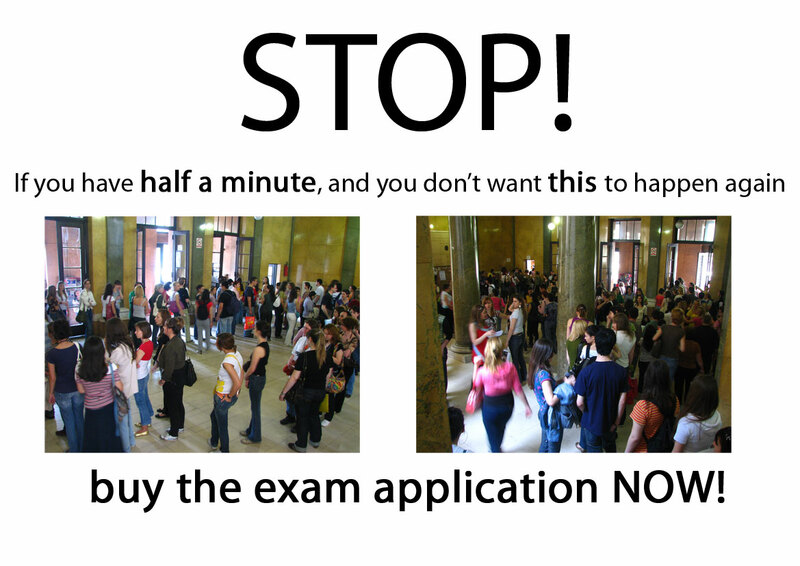 Possibly the simplest solution, excluding trying to fix it through systematic changes (as this would be met by huge resistance of the very numerous and influential change-is-risky crowd), is glaringly obvious – get the people to buy the forms before the exam period. As I said, this is at most a 20 second procedure, so in the small every day queue of at most half a dozen people, you’d get the forms in 2-3 minutes. This is the English translation of the draft version of a poster which I did in less than 3 minutes in Photoshop. I took the pictures during one of the exam periods, because the idea was in my head for some time now. I’ll do a nicer version of the poster, but honestly, I’m thinking that this is enough. The management unanimosly approved and praised my idea – an idea for which all that was needed was 3 minutes of Photoshop, a couple of Euros for printing and a few minutes of putting the posters up at several key places in the faculty. Why hasn’t anyone thought of such a simple solution? Out of the tens of thousands of students who have over the years sat in the faculty cafes and complained about the queues, out of all the people in the administration whose job it is to make this faculty work, out of the numerous student activists who had set out to improve this faculty and who went through the same problems, why hasn’t there been one other person who thought of something like this? Why is it so difficult to fix a problem even when both the problem and its solution are so obvious? This is just the tip of the iceberg of problems, but what’s striking here is the combination of factors – the regularity of the problem, the huge number of people affected and, most of all, the simplicity of the solution. This goes to show so many things, worst of which is what Tolstoy’s talking about: If the current situation isn’t completely unbearable, people won’t change it. One of my projects in the next several months will try to challenge and change the current mentality towards problems, their solutions and being a more (pro)active student in general. This poster is one of those attempts. I’ll write more about this project in the next few days, and I’ll post an update on how effective the poster was. The exam period queues start in a month and the poster’s going up on Monday, so we’ll see how much effect it will have.Even if it doesn’t produce the desired effect, it will have been useful, because it will be another indicator of what the situation on my faculty is really like. It will also plunge me into an even deeper state of zen needed to live with the fact that I’m trying to help people who don’t want to help themselves, but who am I to complain to life’s little lessons? Posters are only useful if they conform to the rules of “stickiness”. You need to surprise them or force them to break their mindless habit e.g. stuff a few into toilet roll and hand towel dispensers in the bathroom or put the poster on a door then lock it (when they will expect it to be open). So, it has to be something that most people will notice/be surprised by, but it musn’t really inconvenience anyone, because it will be promptly removed, and in any case the problem is such a rare occurance (once every 3 months). After reading your article, I’m thinking of also putting up some posters on the inner side of the toilet door with something like “now that you’re having your quiet moment of contemplation, try to remember to buy the application form” and some other sort of joke posters. It could create a sort of word-of-mouth which would trigger a reaction in people to buy the forms before leaving the faculty. However, the insight you gave me is very true and cool, and I’ll definitely use it in future projects! Thanks a lot! Dear goodness. THE queue. Again. Why should we go for the simple when complicated works just fine? It is what it is supposed to be: complicated. Why messing with its essence? 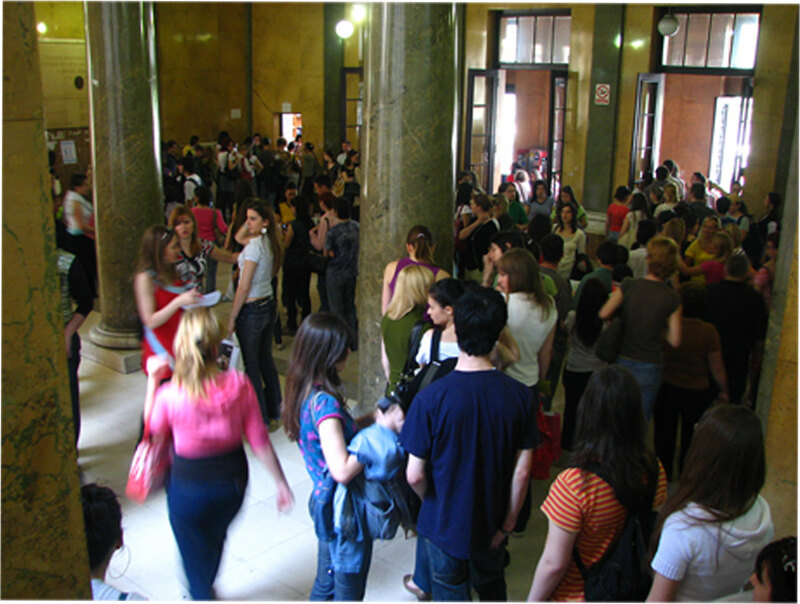 One of the missions of this faculty (ooooooo, yes, it DOES have its missions, you wouldn’t believe…) is to remind its students every single day that studying at the Faculty of Philology in Belgrade is demanding, complicated and painful and not anyone can do that – nor should. It is meant to make you stronger and more prepared for the Cruelty of Real Life after you graduate, if you manage to graduate. The diploma obtained at the Faculty of Philology might not be the guarantee of your knowledge, skill or competences, but it definitely tells volumes of your stamina.